The first car to be made here to sell to the public was the Mitchell car in 1903. Henry Mitchell came to Chicago from Scotland in 1834. Not liking Chicago, he moved to Kenosha (South Port) in 1838 and started making wagons. He learned his trade in Scotland. In 1853 he sold out his business in Kenosha and came to Racine, starting the Mitchell Wagon Works the next year. He made all types of wagons, light, heavy, farm and delivery wagons. He made a heavy, strong, cross-country wagon which traveled west with many homesteaders. His trade name for his wagons was “Monarchs of the Road.” In 1864 he took his son-in-law, William Turnor Lewis, in with him under the name of H. Mitchell and Company. Its growth was steady until it became the largest of its kind in the state. In 1896 William Turnor Lewis and his son, William Mitchell Lewis, bought out the old Beebe Wheel Works, changing the name to the Wisconsin Wheel Works and manufactured bicycles and motorcycles. They started manufacturing automobiles in 1907. Their first car was a single-cylinder horizontal motor. Then they progressed to a single cylinder air-cooled engine and in 1903 developed a small car with a two-cylinder, water-cooled engine of their own design. John W. Bate came up from Chicago and worked on the engine. The name of the concern was changed that year (1903) from the Wisconsin Wheel Works to the Mitchell Motor Car Company. In 1904 a four-cylinder engine which John W. Bate designed was put on the market, increasing production by assembled units being put together on side lines and then assembled as a unit on the chassis, making the Mitchell Motor Car Company a pioneer in mass production. Mr. Bate seemed to be the guiding genius along the assembly line idea and William Mitchell Lewis was quick to see its advantages and appreciate its value. 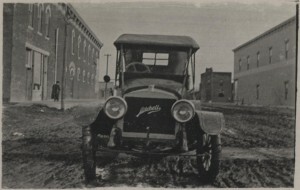 The Mitchell Wagon Company and the Mitchell Motor Car Company consolidated in 1910, forming the Mitchell Lewis Motor Co. In 1911, the company employed 3,000 people, the factory covered 25 acres of land and had 60 acres of floor space. Plant No. 1 was on the south side of Packard Avenue, plant No. 2 was on Washington Avenue and Center Street. The City Hall is on part of the old Mitchell site. William Mitchell Lewis withdrew from the concern in 1917, and it closed down in 1923. 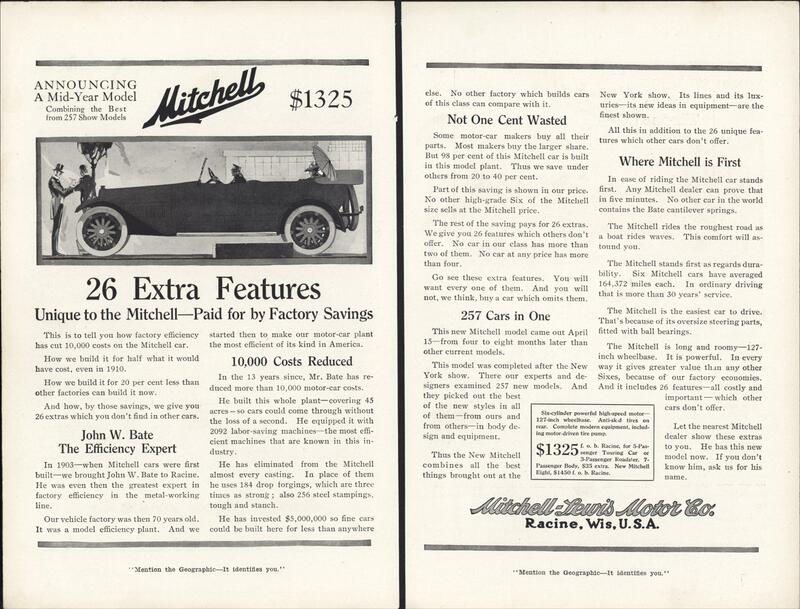 Mitchell-Lewis Motor Company was founded in 1900 in Racine, Wisconsin as a motorcycle maker spin-off from the wagon maker Mitchell & Lewis Company Ltd. The company began manufacturing automobiles in 1903. 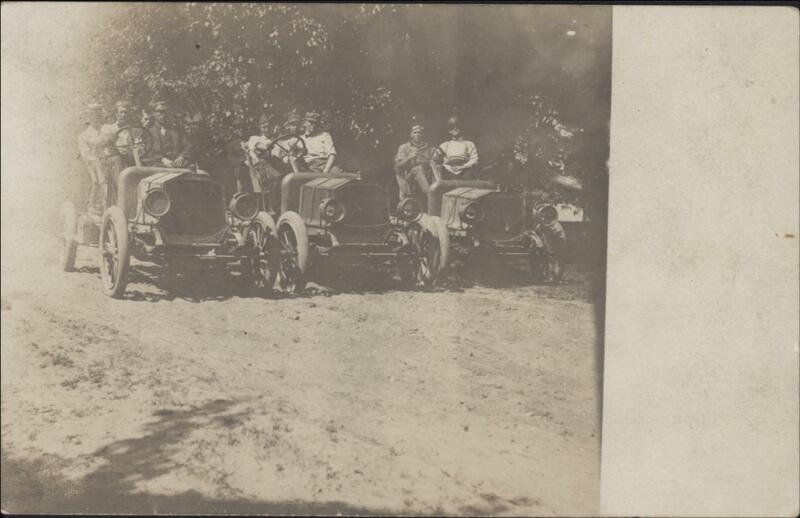 The wagon business and auto companies were combined into Mitchell-Lewis Motor Co. in 1910. 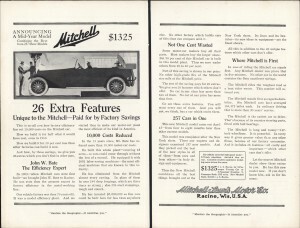 The Mitchell car brand produced automobiles from 1903 to 1923. This 1910 Mitchell car has so many amazing features, I’d like to take one for a drive. $1,325 in 1910 dollars translates to $34,160 in 2014 dollars, so that would be somewhat above average for a new car these days. However, John Bate, the efficiency expert hired by Mitchell, was able to cut the price of the car in half. Definitely a good advertisement. 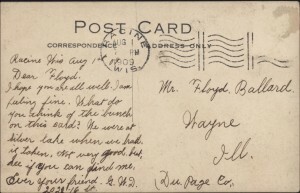 The postcard reads as follows: August 1, 1909. 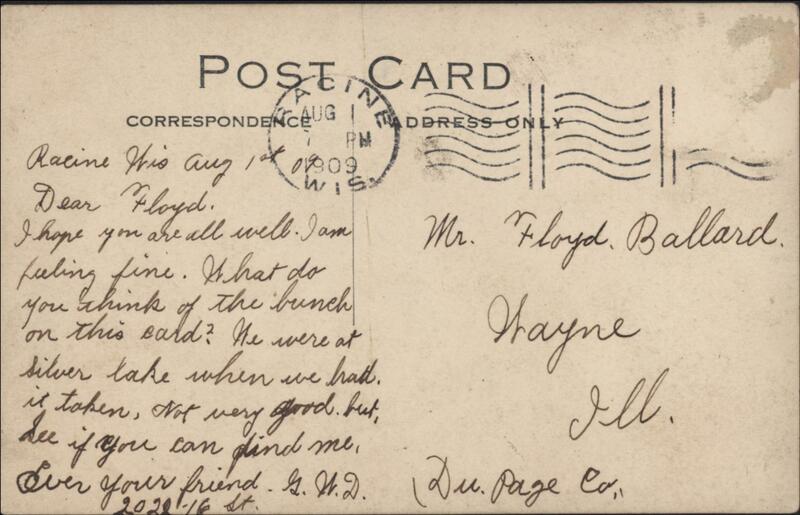 Racine, Wis. Dear Floyd, I hope you are all well. I am feeling fine. What do you think of the bunch on this card? We were at Silver Lake when we had it taken. Not very good, but see if you can find me. Ever your friend, G. W. D. 2022 16th St.
My great grandfather died at Mitchell Motor company in April 1910 during a steam pipe malfunction. Am wondering if there are any more details available on this accident?